Byline, a sweet RSS reader, received an update to version 3.2. 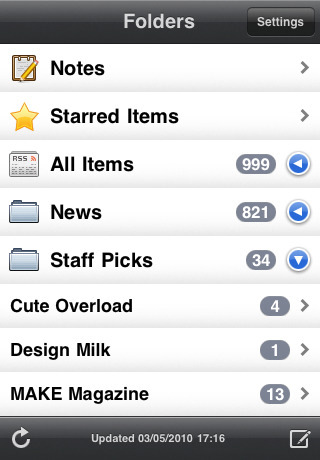 The update adds a few new features to accommodate the iPhone 4 and iOS 4 including; high-res graphics and multitasking. Check out the What’s New section below for full list of the new features. As you can imagine… I love blogs. I not only love my informational, news, iPhone, hacking blogs but I also love my mom, cooking, baking, decorating blogs. I know… it can be a strange combination at times. So, like every blogaholic, I need a good RSS reader application. I have found Byline to nicely suit my needs and after today’s update to the app (version 3.0)… I just had to pass it along.